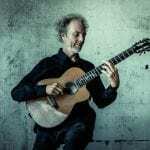 Award winning guitarist, composer, publisher, and music instructor Peter Sprague has worked with some of the finest contemporary jazz artists alive such as Chick Corea, Dianne Reeves, Sergio Mendes, Hubert Laws, and Billy Childs. In 1974 he completed his musical studies at Interlochen Center of the Arts. In 1976 he moved to Boston and studied classical guitarist with Albin Czak and jazz guitar with Pat Metheny. Peter has recorded 26 of his own records and has been part of over 350 other recordings. He runs his own recording studio called SpragueLand. In 1985 he accepted teaching positions at both the Musicians Institute in Hollywood and the California Institute of the Arts in Los Angeles. He currently teaches every summer at the UCSD Jazz Camp in San Diego. Peter has published several books highlighting his teaching concepts including his ever popular The Sprague Technique. He has also worked closely with Chick Corea in releasing several of Chick’s music books including the Jazz Solos of Chick Corea.